Maybe I was being too harsh on the good people of Aaron's. Were they essentially the same as any other financing option? I mean, I'm not arguing that Best Buy or Sears be boycotted, and they'll finance the exact same stuff as Aaron's sells to their rent-to-own customers. Maybe rent-to-own is a reasonable business model. In any case, I've never even set foot in a store like this. Maybe I should give them a chance. The TV could be purchased for $79/month for 24 months. This works out to $1,896 over two years. There is an option to buy the television for $1,200 within the first four months. After the fourth month, the total purchase price would be the $1,896, even if paid for earlier than the 24 month term, or in a lump sum. The price does include warranty service, setup, and delivery. However, this model can be had for less than $800 from Amazon, so it's a terrible deal no matter how you slice it. 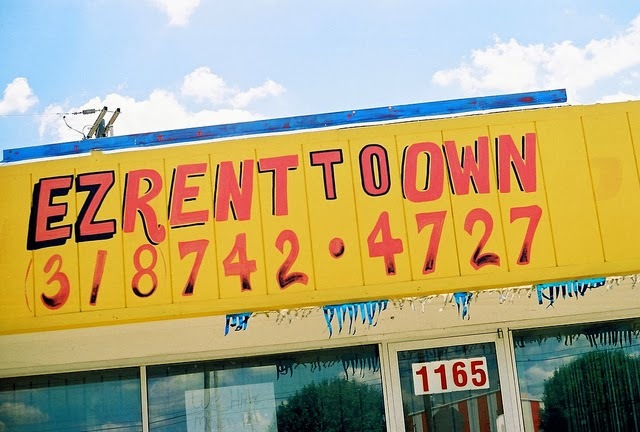 Rent-to-own, at least in this situation, is much worse than even a typical financing situation. For one, the initial price of the television is about 50% higher than what you could find in a traditional, cash-up-front purchase from an online retailer when using a credit card. Second, when you calculate the total cost owed on a $1,200 television, it ends up costing $1,896 over two years with $79/month payment. The "interest" owed would be about 48% on a two year loan. (Though the Aaron's salesman noted that it's not really interest, since it's a rent-to-own situation and not financing.) Still, a rose by any other name still ends up costing you an extra thousand dollars. Back to the conversation my wife and I were having. Considering how bad a deal this was, I was honestly confused about why anyone would ever shop at Aaron's. Mrs. Done by Forty wasn't. "They just don't have the money to buy the furniture or the television," she said. "And they can't get traditional credit." "So why not just get a used television or used furniture on Craigslist?" "Because they probably don't even have a few hundred dollars right now, and they don't want something used anyway. They want something new. It's just something they can't afford." As usual, my wife had the insight that I rarely do: people rent-to-own new things because they want something new, whether or not they can actually afford it. Aaron's and Rent-A-Center, along with Amazon and Sears and any other number of retailers, aren't banking on customers like me. Their customers don't want a two-generation old television or a gently used couch purchased from some stranger on Craigslist. Their customers actually want something new, and nice, too: just as nice and new as some upper middle class yuppie would buy in cash. The rub is that, presumably, they don't have the cash. So what do they have? The working poor (and the working middle class) might not have a lot of cash lying around, and perhaps no wealth at all to speak of. But they do have something of incredible worth: an income. Working people have a paycheck coming in every couple weeks or every month. They might have a negative net worth; but they also have significant purchasing power in the form of future income. Rent-to-own retailers and financiers are catering to that side of the dichotomy: the people who have little cash on hand, but hundreds of thousands, or millions, of dollars coming in regularly over time. Not to get all Marxian, but if all you have is your income (or labor), you're in a crap position to make large dollar purchases. You can save for months and years and buy something at the end of that period. Or, you can get the thing you want now, via rent-to-own or financing, and pay much more for it over a longer period of months and years. Logically, saving up and buying later is often a better option. But as Jason Hull might say, Monkey Brain doesn't like that answer. Our base instinct is to get the stuff we want right now, and to pay for it later. When we give into this instinct, we become more reliant on our income and place an anchor on our plans to get ahead financially. The act of using future income to pay for past purchases prevents us from building wealth. If I had my druthers, I'd want our state to outlaw rent-to-own stores in the same way, and for the same reasons, that we outlawed payday lenders. As of 2010, it is illegal in our state to provide payday loans or to charge more than 36% interest on loans less than $1,000. If we are comfortable with the precedent that certain businesses (payday lenders, drug dealers, prostitutes) or practices aren't allowable because they harm our citizens, why would we allow rent-to-own businesses to operate in our neighborhoods? My wife takes a more measured stance. Today she asked me how rent-to-own was really that different from taking out a car loan. The premise is the same: the purchaser wants something he cannot afford in a lump sum, so he trades his future income in order to get the material good right now, paying much more over a period of years. Isn't the borrower essentially buying a car on a rent-to-own model? After all, you don't actually own the car (i.e. - you don't get the title) until you make your final payment. And isn't there greater financial damage caused by car loans than by rent-to-own couches? I'm torn on the issue, especially since there's zero chance voters or politicians will outlaw car financing. But I naively think that if we can get rid of payday loans, we might be able to do the same with rent-to-own businesses. What do you readers think? Is it best to let the market operate without interference, trusting businesses and consumers to make decisions that are in their best interests? Or is protection for consumers justified? With you on this all the way! These companies prey on the people who can barely afford the products. Unfortunately the only other way to get people to stop using them besides closing them down is by telling people to live within their means. But whose to deny someone that they shouldn't purchase something because they don't have as much money as their neighbor. They might work as hard so don't they deserve the same? Tough question to answer, Amanda. I think the idea that someone with very little money deserves the same sort of furniture and gadgets is a tricky one. That notion is likely what these stores are taking advantage of. "prey on the people who can barely afford the products"... and are clearly extremely bad at maths!? Surely most people can work out that £800 / 79 = roughly 10 months (or if not use the calculator on their overpriced brand new iPhone 5s they no doubt own!). If you can't wait 10 months, a blink of the eye in terms of a lifetime, to buy a nice shiny new TV, then you will unfortunately likely be poor for life. I agree that people don't realise the price inflation. But I also think car loans are bad too :p and any personal loans. Cause I'm always a saver, and a bankers daughter. I love that you and your wife can see things a little differently, and share that view here. As for the way forward, I'm not sure, but thanks for making me think! Thanks, Sarah! We're very debt averse and particularly against businesses whose model is to profit off of the bad decisions of poor people. It's great to see another blogger who's of a similar mind. I hadn't realized you were a banker's daughter. That's cool! I once met someone who used to work in the repo department for one of these places. So when you stopped paying your bills for these items, he and a couple other guys would come to your house and take your couch back. The stories he told were terrible about the things people would do to prevent the repo guys from taking their stuff. One time he said someone pooped on the couch in front of the repo guys in the hopes that they wouldn't take it back. They still had to... so. gross. That is an incredible story. I have to wonder though: after poo-ing on the couch, why would the original owner even want it. It's a scorched earth tactic. I've always wondered how the repo guys get into the house in the first place. Do the owners let them in? There's a business quote: If you want to get rich sell to the poor. Rent to own is saved for customers whose credit is so bad they can't even get stores credit at 24%. If you can't even wait for layaway than you should pay a stupid fee. At least they get a TV, which is better than a 100% tax on people. You buy a house for $200,000 you end up paying over 400K with the interest, what if someone said that's too much? We that had a gas cap in Hawaii on the price of gasoline which lasted two weeks because it made prices volatile and was responsible for shortages. That's an interesting idea, Charles. A similar problem is probably seen with rent control: government interaction causes shortages and, in some cases, higher (and ironic) rents. Still, we've had several years without payday loans and with a cap on the interest rates of small consumer loans here in Arizona. The economy hasn't ground to a halt. The thing I'm arguing for is a protection against poor people in particular. I'm not as worried about the middle class or the wealthy because, if someone takes advantage of them on a couch or a television sale, then they have the income or wealth to weather that. Poor people have very little margin for error: these sort of financial blunders can be much harder to come back from. Charles, the issue isn't that the true cost is double but rather how quickly it doubles. For the true cost of a 30 year mortgage to double would take an interest rate of about 4.6% where the effective interest rate for an item that doubles in true cost over 1 year would be 100%. Not to mention the lump sum cost is often marked up 50% at these types of stores. My opinion is that they are absolute scams and the people in charge know it. The ground level employees may not realize how bad the deal really is, but management does. You always ask such tough questions I'm not sure how to answer! :) I do think the concept of renting to own is just ridiculous, and preying on people who don't make a lot or manage their money well. I suddenly feel very proud I held on to my crappy, boxy TV till a friend gave me a huge used flat screen FOR FREE! Second hand all the way baby. Works great! One word: Usury. Of course, the problem is soooo much bigger than just the rent-to-own stores. It's our whole crazy "have it all right now" culture that breeds this sort of thing. My grandfather worked as a repo man for a stint back during the depression. He said one of the worst days was when he had to take a baby out of its crib to repossess the crib. I dunno... for purchases that people really NEED, like a car or a home, I can see the need to finance the thing - though I think most people could get by with far less in terms of both vehicles and housing... but that's another topic. But for stupid stuff like couches, fancy dining room tables and stereo systems... it just feels criminal to me. Seems like there should at least be some sort of limit on the amount of interest that you end up paying. Great point on the usury. There's a long history of societies preventing predatory lending. That story of your grandfather and the crib is incredible. I can't imagine how hard that must have been. Like you said on the predatory lending, it feels criminal. A limit on interest would be a reasonable control on the market. This is only sort of related, but I can't stop thinking about it. One time I got called to jury duty, and they had us all in the courtroom asking us questions. They tell you a bit about the trial in that process and it turned out it was a usury case where the guy on trial was making loans at something incredible like 35% interest, plus he was charging big fees on top of it. Anyhow, the guy looked really familiar to me, and his name sounded like I'd heard it before, but I just couldn't place him. Then finally it hit me. He had been a student at the music school where I used to work... and the part that totally killed me was that he was one of "those" students who NEVER paid his bills on time. All I could think was "You scumbag - here you are committing highway robbery with those interest rates - and you've obviously got money or you couldn't be lending it out, yet you can't manage to find $15 to pay your starving music teacher?!?" Needless to say, they didn't seat me on the jury. I always think about that story whenever the topic of ridiculous interest rates comes to mind, and I have to admit, it gives me very little sympathy for those types of lenders. I don't have a lot of sympathy either, EcoCatLady, for that kind of money lender. But I'm more comfortable with the idea of a market with reasonable constraints on it than most people. For a lot of PF bloggers, I think the idea of a truly free market sounds idyllic. That's a slippery slope since that statement means to dismantle capitalism. Start a company based on taking someone else's money albeit charging a large fee. I don't blame anyone for not having money but there's no excuse for not educating yourself on how this works. Going into debt is the same thing, period, end of story. To me, anytime you ask for your local, state or god forbid federal government to "ban" something, you are walking down a path that's begging for trouble. I'm not arguing to "dismantle capitalism". Lots of businesses and business practices have been banned when our society decides they pose a threat. The slave trade was once big business here. Should we have let the free market operate without government interference? Narcotic drugs used to be widely sold in tonics. Brothels were commonplace in the U.S. until legislation crept up in the late 1800's. Child labor, unsafe working conditions, practices that pollute...the list goes on and on. Whether or not you agree with these practices is just a matter of opinion. The point is that we have precedence to define the market. The free market does not operate without limits or controls. As for asking the government to do something, I'm really arguing for a referendum: that is how Arizonans voted down an extension of the law allowing payday loans. I'm all for capitalism; but I'm also pro-democracy. Let the people decide. But you don't REALLY want to let the people decide, or you would let consumers decide if they want to pay the fees/prices. Seems like you're getting caught up in semantics. My point was that our democratic process lets people decide whether they want certain businesses to be legal or not. i.e. - The people have decided they don't want to allow crack cocaine to be a legal product, but some some state governments decided to allow legal marijuana. When I first moved to PA we were poor and didn't know anyone. My mom rented a living room set and a TV from one of those places. Why? because she could afford the low payments and it was easy and simple for her at that time. The sofa also served as a bed for her to sleep in. Do I like these businesses? No! But is a business just like any other. Walk down a poor neighborhood and you will see other business that do these kind of business. You can pay your bill here but each bill will cost an additional $6 for 3 days but if you want it today is $10 extra! So is not just these kind of businesses that take advantage of the poor there are many others. That's true, Britnee. There are many businesses that prey on the poor. The ones that get my goat are these rent-to-own stores, and payday/title loan businesses. I had a friend who used one of these places to stage a house he was selling. He picked out beds and couches and signed the papers. They delivered everything for free and at the end of the month when the house had sold, he told them to come pick the stuff up. Huh, that's a clever way to stage a house. I'm assuming the cost was much lower through a rent-to-own place. Good idea. I've used Aaron's several times in the past - not as a "rent-to-own" but as a "rent". I did several internships in various places around the country, and didn't have furniture (and couldn't borrow from parents because of the distances). I got an entire 1-bedroom apartments' worth of stuff for ~$100/mth (bedroom, kitchen, dining, living room - everything). I didn't need the furniture for more than my internship, so there was no use in buying it. I can definitely see how that could be beneficial to you. I suppose, in this case, I'm willing to throw the baby out with the bath water. I did use Aaron's once, like 3 is Plenty did. In my last job in the Army, one of my responsibilities was getting more West Point and ROTC cadets to become tankers (who *wouldn't* want to become a tanker?!?). I had to give presentations to Camp All America in Fort Lewis, Washington, so we rented a big TV, awesome speakers, and a VCR (dating myself) to show the great video of tanks running over things and blowing stuff up. I paid $100 each day, and two fat, sweaty, bald guys came and set it all up and, when the day was done, came and picked it all up. That said, I don't like those places. I'm too much of a libertarian to say that they should be banned, but they definitely take advantage of framing - $X per month instead of $Y (where Y > X) up front. Great point about framing, Jason. I wish I'd thought of that when writing. And in the case of a short term rental, I can see the real benefit of a store like Aarons. There are definitely some cases where the model would work. I just think the damage is greater than the benefit. This is more about principle as far as I'm concerned. I don't think it's the government's job to take care of consumers and decide what's best for the. Outlawing a business practice like rent-to-own assumes that the state knows what's best for consumers. I also think this is a relatively simple financial calculation. $79 a month. 12 months. Do the multiplication. It's not like it's some complicated medical procedure where it would be extremely difficult for any given consumer to understand the risks they are taking. It's simple math and if consumers want the product now and are willing to pay the high cost of having the product today, it's up to them to decide that. What about a referendum, such as the one that banned payday loans and set a cap on interest in our state? It's not government, per se, but the consumers/voters themselves who are making the call. Even with elected officials, they are (ideally) representing the views of the people/consumers. I'm generally in favor of letting the market operate without much interference. But the notion of certain businesses being illegal isn't a foreign one. We can ban businesses that do harm to our citizens (e.g. - drug dealers, pimps, loan sharks, casinos, payday lenders, etc.) Certain towns go so far as to be dry counties, outlawing something as commonplace as alcohol. That all goes to say that citizens can decide which businesses they don't want operating in their neighborhoods. It's not really government, per se, that's the deciding entity. The people are. I have the same mindset as you do. I've never had the desire to buy something large on the spot. If I can get it cheaper from Amazon, I'll just save up for it. I could never spend more just to have an expensive item immediately, unless it was somehow an emergency. Your wife has an interesting take on it. Honestly, I think people will do what they want with their money. If we got rid of these types of stores, they would likely blow their money elsewhere. I sound so pessimistic, sorry! I just think this is where better financial literacy would be beneficial. You're probably right, EM. There's no way to really protect someone from their own desires. If you want something bad enough, you'll get it, in all likelihood. I would like to lessen the ease with which these companies can operate though. Not only are people subject to the poor deals themselves, but also are subject to savvy marketing, professional salespeople, etc. Legitimate businesses have more in their arsenal than an illegal operation would. Ugh, I hate rent to own places. One of my fiance's friends has furnished their entire home with this stuff... couches, tvs, computers. In the process they are paying 200 - 300% more, and constantly running up to the store to pay their weekly (or monthly) bill. It's ridiculous. Not only are a lot of the things purchases they don't need (like an Alienware computer because the friend is a gamer...) they're paying an arm and a leg for it. I get that it's hard to delay gratification (that's why I have consumer debt!) but putting that $X per month away would mean you'd have that item in 10 months rather than paying it for 24! Ugh! That's too bad, Alicia. Once you go down that path, too, it's like any financed decision: the costs are going to stick with you for a while. I'm old enough (64) I remember the time before general purpose credit cards (Visa, Mastercard, Discover, Amex) were available. I had a store charge card with a limit of $100 (kept me from getting into too much trouble). Far more harm has been done to people on a far broader scope by way of credit cards and easy term car loans and mortgages than by Payday Lenders and Rent to Own stores. Each is its own niche. A certain percent of the Rent to Owners are going to poop on their sofas if repo is attempted - this is built into the usurious pricing. A certain number of credit card balances are going to be lost to bankruptcy. This too is built into the business model (you don't really think 15 percent is a fair interest rate, do you?). Since it's so hard to figure out what is right and what is wrong, I say just let them be and serve their customers. What I WOULD like to see is some serious attempt at required Personal Finance education in all high schools. Teach them the power of compounding, and how it works against them or for them. I completely agree that the scope of harm done by financing dwarfs that of the rent-to-own businesses (or payday lenders). My wife was touching on that when she noted that car loans were causing more financial distress than businesses like Aaron's could ever do. Still, I think there's merit in trying to address a smaller problem that has an achievable solution. Additionally, I'm particularly against businesses that exploit the poor. Those in poverty have less margin for error; that group has more need of protection. I hear what you're saying about financial literacy education, but I'm not optimistic about those efforts. There's a post in the works, but my opinion is that financial literacy education is not effective. Those Rent a Center places are such a scam...and you see them in the poorer parts of the city. I lost respect for Troy Aikman for being a spokesman for them. I agree that those types of places are very much like payday loans. It's usurious. I see your wife's point about the car loan, but the interest rates are not nearly as insane. It's not like you'll eventually pay $40,000 for a $20,000 car when you include the interest. That's a good point, Andrew. In fact, car loans are often some of the best interest rates you'll see. If you ignore the fact that it's a depreciating asset, the financing itself is actually pretty advantageous in some cases: below the rate of inflation. I have had renters pawn a TV, only to buy it back a few weeks later. I do not rent to low income anymore, but it is a totally different mentality. When I was in the Service, I used to do a $20 for $30, and received a post dated check for a week later on payday. Many people cannot think ahead. they want instant gratification, Even if it costs more. I hear you on it being a different mindset, No Nonsense Landlord. Thinking about the long term & the future you is always a struggle, but I've noticed that some people are better at cultivating that. Instead of outlawing these places, there should be more laws upfront and clear about the overall cost of the item you're purchasing and what's included. In urban environments, remember, not everyone owns a car. So to pick up a used TV on Craigslist is out of the question. If someone has terrible credit and struggles to buy a TV from Amazon, there's a good chance they don't own a car either, especially considering that many car insurance companies charge higher rates for people with shot credit. So finding a place that includes delivery and has minimal weekly charges for items can be a godsend. In the case of a television, I'm not all that sympathetic because it's not something anyone really needs. But these stores do offer furniture and computers, and both of those could be very helpful to a family, too. It's a good point you've brought up, Tara. However, the financial damage these stores cause is undeniable. I understand that the poor may not have many options. But do you feel these stores present a net positive or net negative impact to the poor? I completely agree with you, I do feel like these kind of business are essentially exploring on the fact that these people are in a bad position and so are likely to give in. Not only in the sense where they charge them a lot more than the items are worth, but also in the sense that effectively the "poorer" you are, the more difficult decisions you have to constantly face on the most trivial issues. They to constantly measure price trade-ofs and decide to abstain from basic good. This wears down willpower and makes them more likely to say "Screw it! I deserve a treat! ", it's disgusting because it contributes to keeping the poor being poor. Well put, DividentVulture. I wish I'd made that point because it's at the root of why I'm against this kind of business. In their pursuit of profit (which is completely justifiable) they make it harder for the poor to get out of poverty. I'm torn like you - on one hand, it's a little frustrating that someone would rather be a sucker rather than simply buy pre-owned/used, but I do agree these businesses are pretty exploitative. Perhaps if there's a limit with how much they can charge interest like payday loans (though 36% is still ridic), then that can be the happy medium? But I guess some just want the shiny and new, so these businesses can help with that, at least, even if it's to their financial detriment. It's a tough one, Anna. I feel like a bit of a jerk, trying to deny people the things that they want. But if the same options are available with less damaging financial consequences (e.g. - via a credit card) then I have less of a problem with the idea of a ban. The idea of a cap on interest rates seems like a reasonable approach though, and a good alternative to an outright ban. No reason to feel like a jerk. The idea that everyone deserves nice things is damaging to society as a whole. Sure, some people don't deserve the luxuries they have and some people who can't afford them do deserve them, but that's because life isn't fair. Giving someone the option to destroy their financial future for short term luxuries because they 'deserve' them isn't helping anyone. Not to mention many of their customers probably aren't even happier in the short term due to the stress that comes with the payments. I remember talking to a friend's parents some 30 years ago or so. They had just rented to own at a local rent-a-center, and as I was talking to him about it trying to figure out why he'd pay that much more in interest. Within a few days he went back and returned everything ... luckily within the time limit that it was returnable without penalty. To me, it seems similar to people who would charge a TV to their credit card and make payments on it for the next three years. The people who shop at Aaron's have the same mentality. Maybe Rent-to-Own is for people with bad credit who don't have access to credit cards? I think you're right, Holly. These stores make their money off of people who don't have access to credit cards. I'm making some assumptions, but my guess is that these consumers don't have great financial habits and would be better off going without the t.v. or furniture or what have you. Ahhh, this is a tough one. I'm torn, really. I think places like Aaron's and payday loans and car title loans are obviously predatory, but due to circumstances/financial illiteracy/igorance of the public, there is obviously a market for them. Yes we could outlaw them, but if people needed money to make some purchase, or pay bills or what not, they would likely find it. I'm of the belief that if there is a need for something in the market, the market will meet that need. Chances are, if we outlawed places like Aaron's and payday loans, these souls would still find the money, only now circumventing the law to do so. And the characters they borrow from would probably charge higher interest rates, fees, penalties, etc. I'm not a fan of them, but I don't think the answer is to outlaw them as much as I think it is to improve financial literacy. You're probably right, Ryan. There really isn't a way to protect someone from himself. I'm not optimistic about financial literacy being the cure, either, though. Personally the thought of shopping somewhere like Aaron's makes me cringe with all the extra cost added on like that. It almost seems like daylight robbery doesn't it? But I myself used to be guilty of buying now and paying later with high interest catalogues and car finance too. Because as you say, our instinct is to want something 'now' not when we've saved up for it. I think the key here is financial education for those who are willing to go through with such a bad deal. I don't know how this should be rolled out but I think the earlier this can happen in a person's life, the better. I think we've all made some similar mistakes like that, Hayley. I'm not bullish on financial education or literacy, but perhaps with some new approaches those classes will have better results than they've had to date. Apparently I'm a monster, because I just shrug my shoulders and think, "If people are willing to pay for it and it's not obviously harming anyone, then it's a valid business practice." I guess I don't see it as my job (or the government's job) to "protect" people from their own bad financial choices. They can get free furniture off of craiglist like I do, or they can waste their money on things that they can't afford. It's their choice. There's really no reason to prevent people from spending money how they would like to. Oh, you're definitely no monster! I think you just have a more libertarian approach than I'd take. I'm more comfortable with the idea of community decisions regarding financial matters, because we all bear the consequences of poor financial choices. For example, a cap on interest rate charges seems reasonable to me, because when someone claims bankruptcy on credit card debt, or any other debt, those costs are passed on to all consumers by that lender. I certainly don't begrudge people the right to buy something new, even if they can't really afford it, but I do think that companies that are based on taking advantage of people's financial ignorance should be outlawed or at least more heavily regulated. Agreed, Bryce. A little regulation would go a long way to protecting consumers. So ridiculous! It is making its way to cell phones though. All of those non-contract deals you see include paying off the full price of the phone monthly. So you end up paying 600+ for the phone. Thanks, Evan. I hadn't made that connection but it's a really similar comparison. People are basically renting to own their cell phones at inflated prices, via those subsidies.